Last September we announced Google Sync with push Gmail support and 2-way sync for calendar and contacts for iPhone, Nokia E series, and Windows Mobile devices. Tomorrow we are taking the next step towards access from any location, on any device by launching new administrative controls that give these devices mobile access to Google Apps. 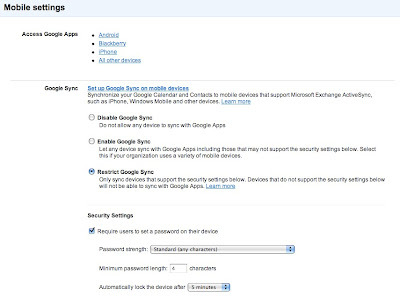 Without having to deploy any additional software or manage enterprise mobile services, Google Apps Premier and Education customers will be able to manage their employees' mobile devices right from the Google Apps administration control panel. For more information on how businesses can take advantage of this new functionality, check out our post on the Enterprise blog. I think it will also be nice for android user to have a remote data wipe out from google account or gmail itself. Any idea when/if personal users will gain this feature?
" iPhones, Windows Mobile devices, and Nokia E"
My company just moved to Google Apps...but I cannot yet get my co email on my Droid, but the iPhone dude next to me can. Why isn't Google pushing this for their own devices? As an employer I would love to be able to see just where our employees are going during the day. A google maps feature for this would be nice so that I can track where the phone is going. Or so that I can send the police to pick up the guy who stole my phone. WebOS users need this too!! Please! Just remember, when asking for GPS tracking, that if YOU can enable it, ANYONE can enable it. Same goes for remote wiping. Nice features, and most corps require them, but they ARE a double-edged sword. > Last September we announced Google Sync with push Gmail support and 2-way sync for calendar and contacts for iPhone, Nokia E series, and Windows Mobile devices. Note that this is supported on Nokia N series also. Not that it does any good, as it is supported through the MFE application which can work with only one email address. So, if you already have an office email, you cannot add gmail. Ironically, E series users are most likely to have an office address setup already - which will make it impossible for them to add gmail account too.